An online community to connect you with fellow van dwellers and share stories from living on the road. My intention for 2018 is to 'Let Go'. Personally, my strengths lie in being persistent, reliable, ambitious while at the same time being polite, easy to fit in, diplomatic and very adaptable. My creative side loves new ideas while my practical side allows me to manifest and create these ideas. With all of these things, I have a deep rooted confidence in my abilities. I am a seeker and searcher. 2018 will be more of that - seeking a higher truth. I don't know what that looks like but when I find it, I am confident that my initution will let me know. I am going to devote most of my time to visiting communities/communal living of all kinds - ecovillages, cohousing, intentional communities, etc. Sign up with your email address to receive regular news and updates. This year will be full of transformation and change. What other 30-day experiments should I try? Comment below and I will try them! The video is my 'mind movie' for 2018 recommended by Dr. Joe Dispenza. I watch it each morning after my meditation. This Annual Review will answer three questions. What went well this year? What didn’t go so well this year? What did I learn? WHAT WENT WELL: This has been an epic year - a year of great adventure, much introspection, and a better understanding of my purpose in life. I traveled throughout the US and Canada for 8 months (Jan-Sept), started down the spiritual path, and began 'letting go'. I made more money than I ever have in my life in only 4 months of work. WHAT DIDN'T GO WELL: I shutdown my land investing business while I was traveling. It wasn't a bad thing - I was able to enjoy the freedom of the road. It simply took some time to get the business started back up and running in September. My last consulting gig was very stressful and I found myself reverting back to my old way of being - I was frustrated at the lack of change in the business and wanted to use shame to produce change. After speaking with my mentor, I chose positivity and the gig finished on a high note. WHAT I LEARNED: Earning more money than I ever have in only 4 months is shocking and amazing to me after struggling and swimming upstream all of my life. Abundance is all around me - I simply need to let go and accept it. I also learned that I must lead with love. Nothing productive will come from trying to force change. JANUARY-MARCH: The year started off on a 3 month ski road trip in January using the Mountain Collective Ski Pass to hit 12 different mountains. The highlights were 300" of snow in Mammoth, California, driving through Canada in the winter, catching first tracks in deep powder at the unknown gem - Revelstoke, Canada, skiing and exploring Banff, Canada, and finishing the trip in Telluride, Colorado and Taos, New Mexico with powder days. APRIL-JULY: It was then off to Denver for a consulting gig in April. Then a cross-country drive to see friends and family in NY, MA, RI, NH, and Maine. Went to my cousin's wedding in Massachusetts, saw many college friends for the first time in 4+ years, and the van broke down in upstate Maine (luckily Kara and her family were there to help!). Then I drove from Maine to Minnesota through the Upper Peninsula of Michigan (beautiful country in the summer) for the 4th of July to see my cousins. After that, I drove to Denver to begin a summer roundtrip with Jen. JULY-AUGUST: It started a little rough with altitude sickness camping outside of Telluride and some bad food but it quickly improved once we arrived in the North rim of the Grand Canyon. We then drove to Lake Powell for a week on a huge 70 foot houseboat with her brother's family. We towed a speedboat so we could waterski and tube during the day and go paddleboarding at night. I definitely plan on exploring Lake Powell more - just in a smaller boat! Once we departed from the boat, we hiked Zion, Capitol Reef, Yellowstone, Glacier, and Grand Teton National Parks. After that we drove up to magical Banff and Jasper National Parks in Canada. It was packed with tourists but was still so impressive. The Canadian Rockies feel like they are monstrous and right on top of you and there are clear, cold deep blue lakes every few miles. I swam in almost every lake that we passed especially the snow melt lakes at the high altitudes. SEPT-NOV: It was then back to Denver for a followup consulting gig and then to Austin for another consulting gig. I returned to Denver for the final consulting gig with the same company - over the course of three 2 week visits, we fired 3 employees, hired 2 employees who subsequently hired enough people to triple the staff. Revenue has increased substantially and the foundational business systems and processes are in place for big future growth. Also invested in a business coach for my real estate company. DEC: After Thanksgiving in Denver, we drove to Gaudaulupe and Big Bend National Parks for some great hikes. The short roadtrip finished in Austin, TX for Ryan Moran's awesome Capitalism Conference. I then drove leisurely back (except for an uneventful stop by border patrol in Alabama) to Washington, DC for Christmas. SPIRITUAL HIGHLIGHTS: a sweat lodge in Sedona, saw two Native American healers in Banff and Sedona, breathwork with Zach Rehder, walking many labyrinths, hiking to vortexes, meditating in nature, had readings from a pyschic and an astrologer, group meditation with Tara Brach, many floats, full moon meditation in Boulder, CO. The day and time is seared into my mind. I was parked 2 blocks from Venice Beach, CA, hanging out on the beach, surfing, and working a few hours per week. Life was good - relaxing and enjoyable but I was itching for something else, something bigger than simply having fun. I was listening to Ari Meisel's Leverage Podcast and that is when I heard, The Land Geek, Mark Podolsky being interviewed. I knew with 5 minutes of listening to him describe his business that it was going to be my next venture. I am ambitiously lazy - meaning that I hate to do repetitive tasks - and this business fit that 'process-driven' model perfectly. Mark's 'land investing' business fit all of the criteria so the next month, I bought his Land Investors Toolkit online. I then attended his free bootcamp a few months later (however I didn't purchase coaching from Mark). I dove into land investing full-time in July 2016. Since then, I have purchased 14 parcels and 9 sold of them (a few for cash but most are financed). My monthly recurring income for the next 8 years (revenue coming in from financing the sale of a property) is $1200 currently and growing. No tenants, no termites, and no toilets. In hindsight, I would have purchased The Land Geek coaching - it would have jumpstarted my business and I would have been profitable much sooner than I was... but I'm a do-it-yourselfer at heart and I struggled through the ups and downs early on investing in land. I bet you are thinking - why is he sharing this gold mine with me? The reason that I am more than willing to share is because there are more than 3000 counties in the US with 1.9 billions acres of land (in the lower 48 states). There is MORE than enough land to be bought and sold in America! I will answer any questions in the comments. I recently added a wifi adapter in my van and it allows me to connect to any open (no password required) wifi network without having to go into a store that has free wifi (e.g. Lowes, Starbucks, Home Depot, McDonalds, etc). 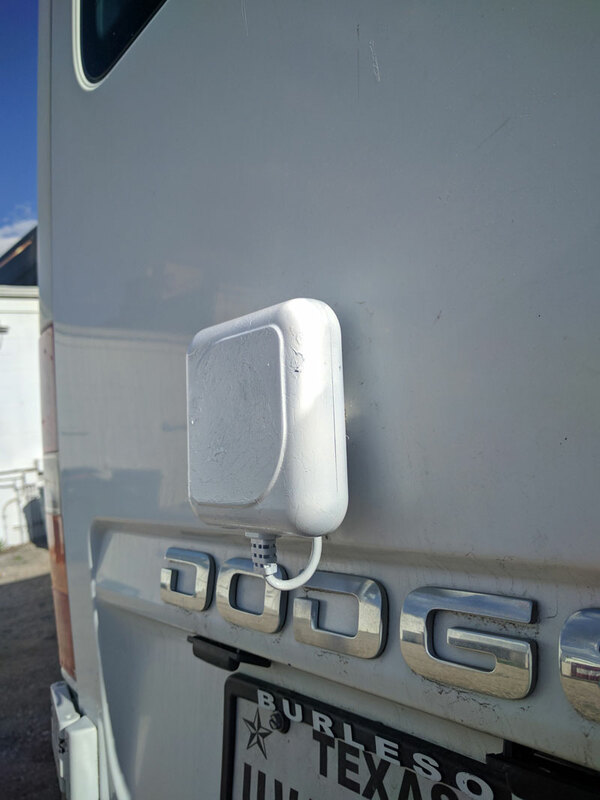 Since the antenna that I purchased is a directional antenna, I have to park the backdoor of my van facing the storefront since the antenna is mounted on the backdoor. Otherwise, it may not amplify the signal. I recommend mounting a directional antenna on the roof if possible. I went from one bar of wifi signal to full bars of wifi even though I was parked more than 100 yards from a Lowes. The Alfa wifi adapter connects to my laptop via USB. This setup only allows for one device to be connected (via USB) at a time. The solution to this problem is to re-broadcast the wifi signal and allow other devices to connect through a wifi repeater (your smartphone, additional computers or tablets, etc): Alfa Wifi Repeater and Range Extender. Note: this device requires AC power. All in this, wifi amplification system in my RV costs about $60. Not bad for some free wifi in my van! In January 2017, I left from Los Angeles, CA to start my road trip to all of the mountains on the Mountain Collective Ski Pass. The mountain, the conditions and my accommodations for each ski resort is listed below in order. I drove a total of 6,800 miles and went through one windshield wiper, two bottles of windshield fluid, one oil change, two ball joints, two struts, and five glow plugs. Mammoth Lakes, California 300" base of snow - 30-35 degrees F - sunny and blue skies One of the largest ski resorts in the US. It was a great start to the trip - great coverage and blue-bird conditions with low wind. The terrain was very accessible and easy to get around. Lots of steep, fast runs (which I loved!) ACCOMMODATIONS: Mammoth Guest House (an awesome old wood A-frame). Squaw Valley, Tahoe, California 158" base of snow - 39 degrees F - raining/sleet/snow mix and windy (40 mph at mid-mountain and 100mph winds at the peak) Squaw has their first big snow season in almost 5 years however it was one of the worst days of skiing in my life. All of the locals had squeeges on their gloves to wipe away the rain from their goggles. The snow was like Elmer's glue. Conditions weren't going to improve so I only skied one day. 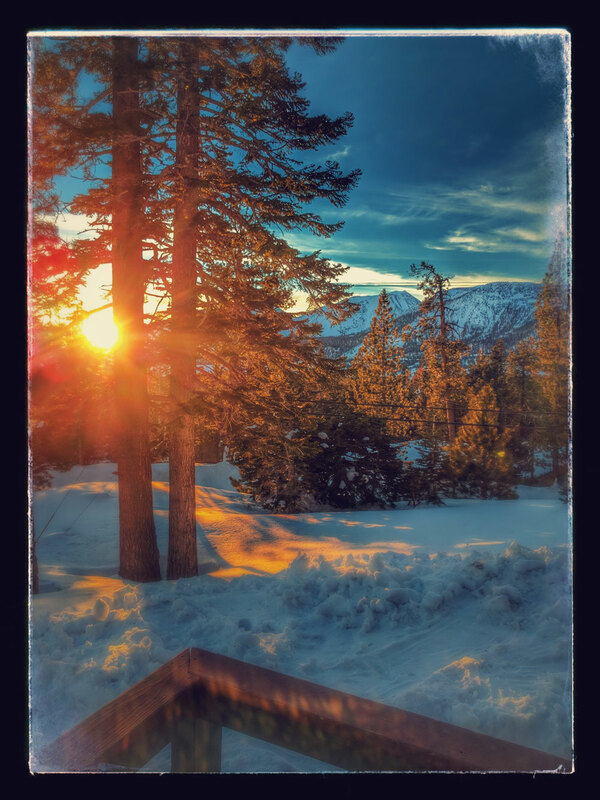 ACCOMMODATIONS: Tahoe Hostel right on Lake Tahoe (about 30 minutes from the mountain) . Alta and Snowbird, Utah 102" base of snow - 30-35 degrees F - cloudy and light snow Met up with Ian who was also doing the Mountain Collective resorts in a van. His Sprinter van is completely new and he has a toilet. Watched the Super Bowl in Elko NV and stupidly left after halftime and Tom Brady proceeded to have a huge overtime win. Snowboarding is banned from Alta. Had some fresh powder both days. Also bought used powder skis and poles for 100 dollars. Alta was my favorite - lots of steep, fast runs. Overall a small mountain. Snowbird had either extreme steeps or moderate, blue runs - almost scary at times.It was fun under the Peruvian lift. There was a Rebel Wilson sighting (Fat Amy from the movie, Pitch Perfect) at Snowbird (sorry - no picture evidence). ACCOMMODATIONS: Walmart Parking lot in Sandy, Utah - next to an Anytime Fitness, Starbucks, and 5 minutes from the Ski Bus shuttle up to the mountains. Sun Valley, Idaho 146" base of snow - 25-30 degrees F - cloudy and light snow Definitely one of the richest and nicest resorts ever. Excellent groomers and caught some powder the 2nd day. Would love to come back on a powder day! ACCOMMODATIONS: Stayed in an AirBnB since it was damn cold at night and parking wasn't allowed on streets due to plowing. Whistler, BC, Canada 101" base of snow - 30-35 degrees F - clear and no wind Crossed the border in one hour including a secondary stop and thorough search of my van. Whistler/Blackcomb was overwhelming big - there were so many runs and wide open terrain to ski that I didn't know what to ski. I skied Whistler mountain in the morning and then took the peak-2-peak tram to Blackcomb for the afternoon. Whatever type of terrain your heart desired, they could provide it. I was there on a weekday (albeit a Spring Break weekday) and 20,000 people were skiing which would crush any other mountain. Watch out in 2017/2018 when Whistler is on the Vail Resorts Epic pass - this place is going to be mobbed. ACCOMMODATIONS: Parked in the driveway of a heli guide in town. Revelstoke, BC, Canada 99" base of snow - 25-30 degrees F - cloudy and heavy snow I arrived in Revi on a Sunday and I waited for a few days since powder was in the forecast. I skied two days of fluffy deep powder on the biggest vertical of any North American ski resorts (almost 8000 feet). Only 3 lifts and 1 gondola service the whole mountain and there is a fair bit of traversing needed to access the whole mountain. This was easily my favorite mountain on this ski trip (fresh powder doesn't hurt either!). Met two cool Aussies (Harleyand Benny). Will definitely come back in the summer. Revi is a hidden gem. ACCOMMODATIONS: Stayed in the Samesun hostel in town (about a 10 minute drive to the mountain). Banff, Alberta, Canada (Lake Louise and Sunshine and Norquay) 78" base of snow - 10-15 degrees F - cloudy and light snow Finished a great few days at Revi and said goodbye to the Aussies - Benny and Harley. I will hopefully visit Harley in Australia in the winter. I then drove over the most avalanche prone strecth of road in North America - 163 avalanche chutes and the Canadian military drives around and shoots a huge howitzer gun at the tops of the cliffs to cause avalanches. As I was driving through a tunnel an avalanche was going over the top of me! Amazingly, even though it was snowing heavily, the roads were fine. The town of Banff is magical and beautiful at night. I followed the storm that came from Revi and I skiied some deep powder in the back bowls of Lake Louise. Switched hostels to HI apline center and it had a commercial kitchen which was awesome! I skied Sunshine which was OK since some parts of the slopes were very flat but I found some good steep stuff later in the day. Locals told me about Toonie day ($2 to ski) at Norquay and warned me about the Jerrys. I went there and skied for 2 hours and then got the hell out since no one knew how to ski! I wasn't skiing - I was avoiding other skiers. ACCOMMODATIONS: Stayed in 2 different hostels - HI Alpine and Samesun in Banff. Both were great places to stay. About a 40 minute drive to Lake Louise and a 20 minute drive to Sunshine. Jackson Hole, Wyoming 157" base of snow - 40-45 degrees F - clear and very warm Stayed overnight in Bozeman where it was considerably warmer than the -10 F degrees in Banff. Then drove the remaining time to Jackson Hole and arrived to 50 F degrees. I was bummed that it was so warm. Switched all of my ski gear to spring skiing. The 1st day was awesome - icy in the morning but it thawed and was great until 3pm. Jackson Hole is big mountain skiing and I only wish I could have skied it with fresh powder. The 2nd day was rough since it didn't freeze overnight and was slushy. I skied only 3 hours. Met a cool German guy - Sebastian (who is a doing a 12 month road trip) and we had dinner. ACCOMMODATIONS: A rough, old hostel built back in the 1950s with the best location ever - ski in/out right at the base of the mountain! Snowmass, Aspen, Colorado 78" base of snow - 40-50 degrees F - clear and very warm Skied Snowmass - long, wide open runs. Most of the mountain is blues, very few green runs or catwalks. The bowls looked great for a powder day. I really enjoyed carving the long, blue runs. ACCOMMODATIONS: Parked at the Carbondale park and ride and the Intercept lot near Snowmass. Telluride, Colorado 75" base of snow - 30-35 degrees F - clear and big powder on the second day Skied the first day on a perfectly windless, clear day. Met an Aussie - Dane at the hostel, caught a ride up with him to the mountain the next morning and skied a crazy amount of powder on the second day (approximately 20 inches). My ski popped off on a run and went shooting down the slope and over a cliff. Luckily a tree branch caught it before it went off the cliff! ACCOMMODATIONS: Stayed at Old Mine Shaft Inn in Rico, CO (about 30 minutes outside of Telluride). Taos, New Mexico 98" base of snow - 25-35 degrees F - cloudy and snowy Hands down some of the best powder skiing of my life. It didn't hurt to be riding with a semi-local (shoutout to Lucas) to show Dane and I where the prime hiking spots were to be found. We skied some fresh powder on so many runs - it was a great end to the road trip! ACCOMMODATIONS: Parked in the Taos ski parking lot on the mountain. In total, I spent about $1250 on accommodations over 2.5 months and $780 in diesel fuel. I went into the ski road trip with very low expectations - I would be successful if I didn't crash my van and didn't break any bones. Luckily, neither of those things happened! Overall, this was one of the most fun road trips of my life - obviously the skiing was great but the people that I met and connected with along the way were what made this road trip really special. Rvparky.com (iOS | Android) - displays a map of rest areas, Wal-marts, truck stops, and RV parks to park your van. I typically use it only for Wal-mart parking lots. Freecampsites.net (No smartphone app) - Displays a map of free and low-priced 'boondocking' or dry camping spots typically in the Western half of the US. Hipcamp.com (No smartphone app) - This is a website similar to AirBnB but is directly solely at camping rentals. You can also search for state and national park campsites. AirBnB.com (iOS | Android) - You might be surprised to find 'camping' spots on AirBnB. I rented a parking space in a guy's driveway off of AirBnB in Whistler, BC, Canada. Simply filter for low price ranges (less than $35 per night). US Public Lands (iOS | Android) - This app show you all of the FREE areas to camp. If you can find a pulloff or cleared area off of a road in a National forest, BLM land, or National park you can camp on it! Foodspotting (iOS | Android) - I'm a big fan of Bizarre Foods with Andrew Zimmern and I love to eat weird foods like tripe, tongue, liver, heart, bone marrow, insects, etc. This app shows all of the unique near your location. AllTrails (iOS | Android) - This app shows you hikes that you can filter by short/long, easy/hard, small/large elevation. Highly recommend this if you enjoy hiking even in the slightest. Trover (iOS | Android) - If you want the cool spots to visit while on the road, you can search by photos from locals and find unique places to check out. Gasbuddy.com (iOS | Android) - It allows you to search for the lowest gas price near you. Super handy! SaniDumps (iOS | Android) - This app is a useful way to find dump stations. What are you favorite apps that you use on the road? Post to the comments. Picture is my Sprinter van in the freezing cold of beautiful Banff, Alberta, Canada. The first step is not an obvious one - it is not researching vans or build outs or where you will travel. The first step toward living the VanLife is getting rid of most of your possessions. It sounds easy but it can be a surprisingly long process. When I began to purge my belongings, I used the Minimalist's 'Packing Party' technique. 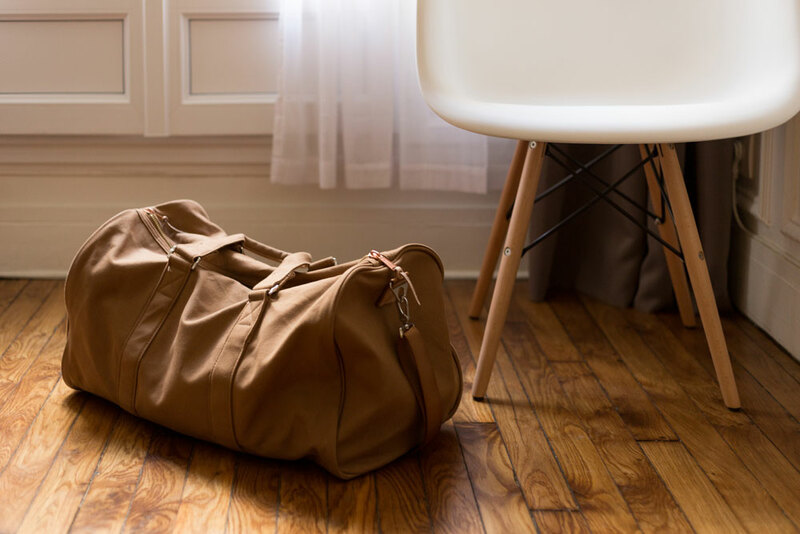 The video is the Minimalists TED Talk about their packing party. You will find that you don't need the majority of your possessions. You will also find that you will feel free and unencumbered. A total of 1.5 hours of driving - 60 miles. When you complete skiing at four resorts in one day, you will receive the 'Day Tripper' pin from EpicMix. In total, we skied 34,464 vertical feet over four resorts. It was a long day but it was a fun challenge to complete. I will be starting an 11 mountain ski road trip on February 1, 2017. The ski pass that enables this is the Mountain Collective pass. For only $400 (about $18 per ski day), it gives you 2 days of skiing at every mountain. This trip wouldn't be possible if it wasn't for this pass - I am eternally grateful for it! The retail price for 22 days of skiing would be over $3000. I plan on staying at each mountain 3-4 days bookended with one day of driving (and sometimes two days). So I will have 1-2 days of rest/non-skiing play at each mountain - if you have any recommendations of things to do, drink, or eat PLEASE comment below. Most of the driving between mountains will be about 5-6 hours except for the 2 days that it will take me to drive to and from the three Canadian mountains (Whistler, Revelstoke, and Banff). I plan on sleeping in the van only when it is reasonably warm (nights that are not below 20 degrees F). Otherwise, I will be staying with friends, AirBnBs and hostels (which I love). I do have a small camping heater and 12 volt plug-in blanket to keep me warm. I have a new set of winter tires, a spare tire, snow chains, 24/7 roadside assistance and I just changed my oil to a lower viscocity of oil (0w30) for the colder weather. My criteria to define a 'successful' trip are very low - as long as I don't crash the van or break my body or get horribly sick, the trip will be considered a success. With so much winter driving, inevitably something will go wrong. I want to be as well prepared as I can be. The mountains (in order) are Mammoth (CA), Squaw Valley (CA), Alta/Snowbird (UT). Sun Valley (ID), Whistler, Revelstoke, and Banff (all in Canada), Jackson Hole (MT), Aspen (CO), Telluride (CO), Taos (NM). Of the 11 mountains, I have only skied one (Telluride) so almost every mountain will be new to me! Here is the map of my planned route (starting in California and finishing in New Mexico). Please comment with any ideas, recommendations, or places to see or visit on my epic road trip! 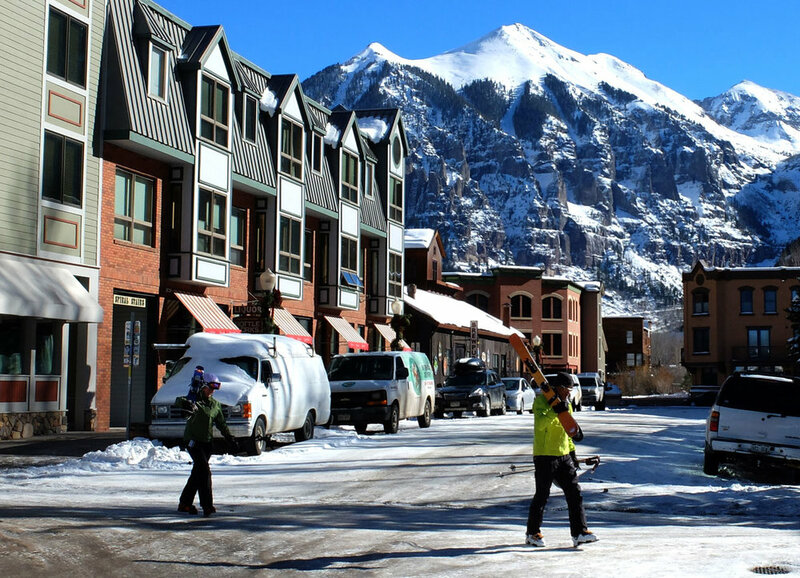 ----- Photo is Telluride, Colorado where guys ski in cowboy hats! Copyright hashtagvanlife.com All Rights Reserved.